The Fryer: a Spring Chicken Becomes a Star | 30th Anniversary Issue | Style Weekly - Richmond, VA local news, arts, and events. The news pages of Style this spring [in 2001] devoted 1,691 words to a chicken. The story of the Expressway Chicken, which unfolds in early March, is beautiful in its simplicity. Poultry illustrates a universal theme: freedom. 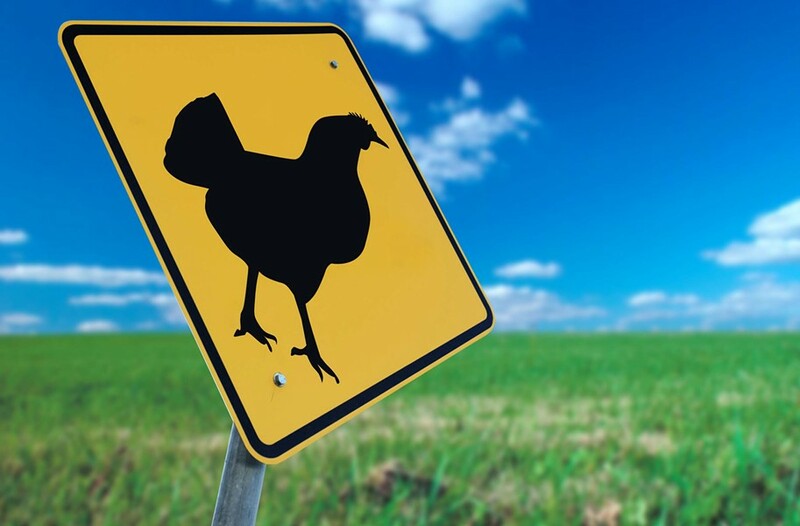 Oh sure, there are jokes about chickens crossing roads. But will they ever seem as funny as they were before the Expressway Chicken? OK, so they never were funny. That's not the point. The first alert comes from Pierce Young and Carrie O'Malley, friends who separately spot the white-feathered fowl fending for itself in the median of the Downtown Expressway, near the Sheppard Street overpass. Fellow Richmonder Beth Wright has seen the chicken fall from a Tyson's truck, thump onto the pavement and scurry past traffic into the grass. Weeks go by. The chicken survives. That means something to Wright. "I just think that [the chicken] has fought to stay alive against overwhelming odds and deserves a decent chance," she says. Readers agree. They send e-mails. They call with lifesaving suggestions. Style calls the Maymont Foundation, which agrees to help. In an attempt to catch the chicken, Maymont sends a zoologist, the director of its nature center and a public-relations professional to the Expressway median. Channel 12's news team, which is On Your Side, dispatches a reporter and photographer. But after about an hour, the search is deemed a failure. There is dismay. Days go by. There is another try, with a net. So close. But another failure. To be sure, there are cynics. The Channel 12 reporter makes light of her assignment! A Times-Dispatch columnist grumbles that this same thing happened years ago. He wrote about it; doesn't anyone remember? State police worry that people will endanger themselves by stopping to feed the chicken in the median. Time is running out. But Maymont is undeterred. It sets a trap. It lays a trail of grapes and cracked corn to the small cage. The chicken, weary and thirsty, follows it. It is captured. An egg is found in the cage along with the chicken (the chicken is a girl!). And on Sunday evening, April 22, the Expressway Chicken is carried to the barn on the grounds of Maymont. Those who have followed the Expressway Chicken are gleeful. A reader sends Style a piece of artwork illustrating how she has been inspired by the chicken's saga of hope and optimism. On the evening news, Channel 12 asks viewers to suggest names for the hen. About 600 people call in with ideas immediately. Eventually, she is christened Frieda. Editor's note: Rest in peace Frieda, the Expressway Chicken.